PR Newswire – THOUSAND OAKS, Calif. (July 24, 2015) – Amgen (NASDAQ:AMGN) today announced that the U.S. Food and Drug Administration (FDA) approved the supplemental New Drug Application (sNDA) for Kyprolis® (carfilzomib) for Injection in combination with Revlimid® (lenalidomide) and dexamethasone (KRd) for the treatment of patients with multiple myeloma who have received one to three prior lines of therapy. 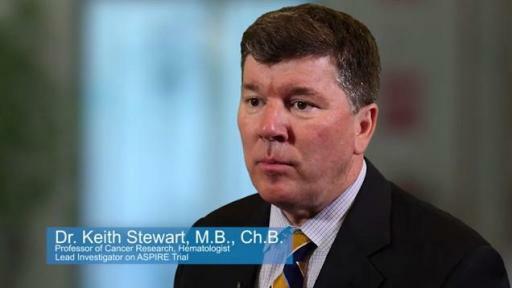 “The ability of this Kyprolis treatment regimen to produce deep and durable responses is critical towards extending the time patients live without their disease progressing,” said ASPIRE principal investigator Keith Stewart, M.D., Ch.B. New onset or worsening of pre-existing cardiac failure (e.g., congestive heart failure, pulmonary edema, decreased ejection fraction), restrictive cardiomyopathy, myocardial ischemia, and myocardial infarction including fatalities have occurred following administration of Kyprolis. 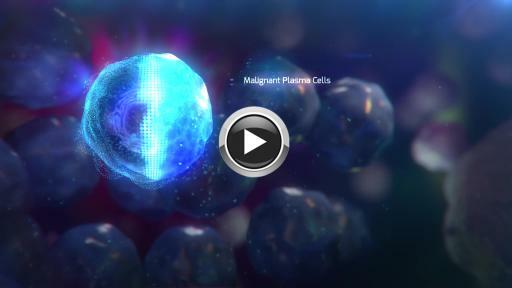 In clinical studies with Kyprolis, these events typically occurred early in the course of Kyprolis therapy (< 5 cycles). Death due to cardiac arrest has occurred within a day of Kyprolis administration. 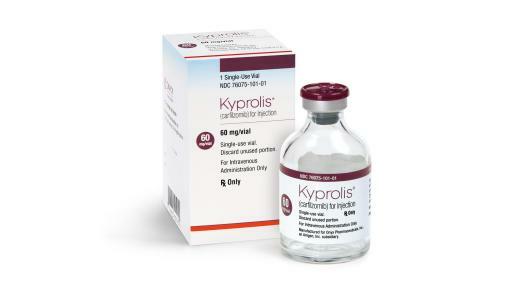 Withhold Kyprolis for Grade 3 or 4 cardiac adverse events until recovery, and consider whether to restart Kyprolis at 1 dose level reduction based on a benefit/risk assessment. While adequate hydration is required prior to each dose in Cycle 1, all patients should also be monitored for evidence of volume overload, especially patients at risk for cardiac failure. Adjust total fluid intake as clinically appropriate in patients with baseline cardiac failure or who are at risk for cardiac failure. In patients ≥ 75 years of age, the risk of cardiac failure is increased. Patients with New York Heart Association Class III and IV heart failure, recent myocardial infarction, and conduction abnormalities uncontrolled by medications were not eligible for the clinical trials. 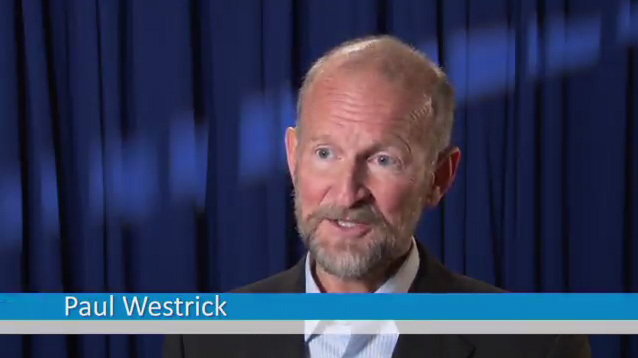 These patients may be at greater risk for cardiac complications. 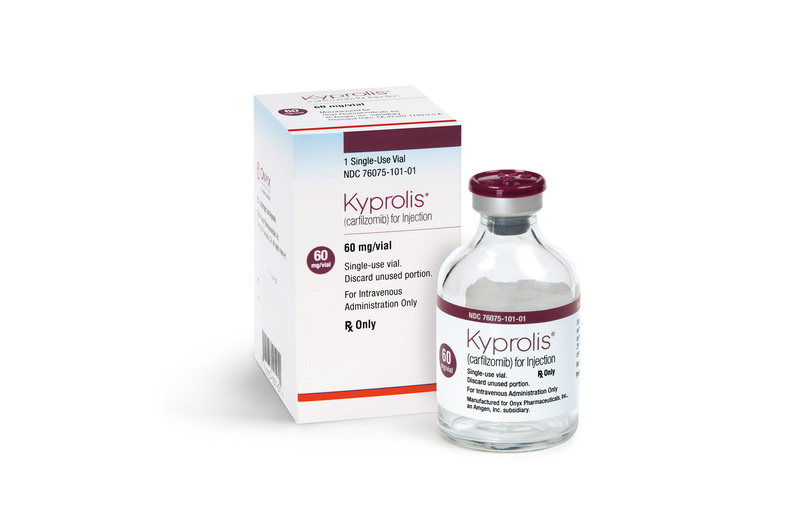 Venous thromboembolic events (including deep venous thrombosis and pulmonary embolism) have been observed with Kyprolis. In the combination study, the incidence of venous thromboembolic events in the first 12 cycles was 13% in the Kyprolis combination arm versus 6% in the control arm. 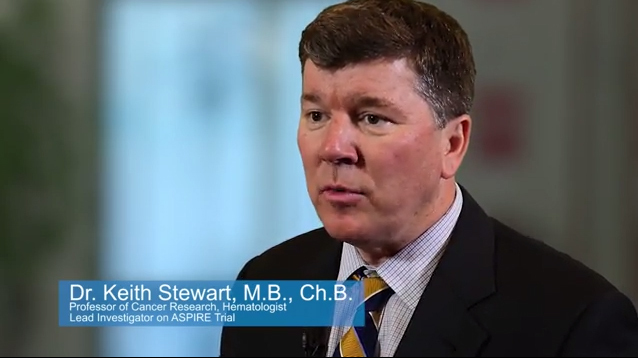 With Kyprolis monotherapy, the incidence of venous thromboembolic events was 2%. Thromboprophylaxis is recommended and should be based on an assessment of the patient’s underlying risks, treatment regimen, and clinical status. This news release contains forward-looking statements that are based on the current expectations and beliefs of Amgen Inc. and its subsidiaries (Amgen) and are subject to a number of risks, uncertainties and assumptions that could cause actual results to differ materially from those described. All statements, other than statements of historical fact, are statements that could be deemed forward-looking statements, including estimates of revenues, operating margins, capital expenditures, cash, other financial metrics, expected legal, arbitration, political, regulatory or clinical results or practices, customer and prescriber patterns or practices, reimbursement activities and outcomes and other such estimates and results. Forward-looking statements involve significant risks and uncertainties, including those discussed below and more fully described in the Securities and Exchange Commission (SEC) reports filed by Amgen Inc., including Amgen Inc.’s most recent annual report on Form 10-K and any subsequent periodic reports on Form 10-Q and Form 8-K. Please refer to Amgen Inc.’s most recent Forms 10-K, 10-Q and 8-K for additional information on the uncertainties and risk factors related to Amgen’s business. Unless otherwise noted, Amgen is providing this information as of July 24, 2015, and expressly disclaims any duty to update information contained in this news release. No forward-looking statement can be guaranteed and actual results may differ materially from those Amgen projects. Discovery or identification of new product candidates or development of new indications for existing products cannot be guaranteed and movement from concept to product is uncertain; consequently, there can be no guarantee that any particular product candidate or development of a new indication for an existing product will be successful and become a commercial product. Further, preclinical results do not guarantee safe and effective performance of product candidates in humans. The complexity of the human body cannot be perfectly, or sometimes, even adequately modeled by computer or cell culture systems or animal models. The length of time that it takes for Amgen and its partners to complete clinical trials and obtain regulatory approval for product marketing has in the past varied and Amgen expects similar variability in the future. Amgen develops product candidates internally and through licensing collaborations, partnerships and joint ventures. Product candidates that are derived from relationships may be subject to disputes between the parties or may prove to be not as effective or as safe as Amgen may have believed at the time of entering into such relationship. Also, Amgen or others could identify safety, side effects or manufacturing problems with Amgen’s products after they are on the market. Amgen’s business may be impacted by government investigations, litigation and product liability claims. If Amgen fails to meet the compliance obligations in the corporate integrity agreement between Amgen and the U.S. government, Amgen could become subject to significant sanctions. Amgen depends on third parties for a significant portion of its manufacturing capacity for the supply of certain of its current and future products and limits on supply may constrain sales of certain of its current products and product candidate development. In addition, sales of Amgen’s products (including products of Amgen’s wholly-owned subsidiaries) are affected by the reimbursement policies imposed by third-party payers, including governments, private insurance plans and managed care providers and may be affected by regulatory, clinical and guideline developments and domestic and international trends toward managed care and healthcare cost containment as well as U.S. legislation affecting pharmaceutical pricing and reimbursement. Government and others’ regulations and reimbursement policies may affect the development, usage and pricing of Amgen’s products. In addition, Amgen competes with other companies with respect to some of its marketed products as well as for the discovery and development of new products. Amgen believes that some of its newer products, product candidates or new indications for existing products, may face competition when and as they are approved and marketed. Amgen’s products may compete against products that have lower prices, established reimbursement, superior performance, are easier to administer, or that are otherwise competitive with its products. In addition, while Amgen and its partners routinely obtain patents for their products and technology, the protection of Amgen’s products offered by patents and patent applications may be challenged, invalidated or circumvented by its competitors and there can be no guarantee of Amgen’s or its partners’ ability to obtain or maintain patent protection for Amgen’s products or product candidates. Amgen cannot guarantee that it will be able to produce commercially successful products or maintain the commercial success of its existing products. Amgen’s stock price may be affected by actual or perceived market opportunity, competitive position and success or failure of its products or product candidates. Further, the discovery of significant problems with a product similar to one of Amgen’s products that implicate an entire class of products could have a material adverse effect on sales of the affected products and on Amgen’s business and results of operations. Amgen’s efforts to integrate the operations of companies it has acquired may not be successful. Amgen may experience difficulties, delays or unexpected costs and not achieve anticipated cost savings from its recently announced restructuring plan. Amgen’s business performance could affect or limit the ability of Amgen’s Board of Directors to declare a dividend or their ability to pay a dividend or repurchase Amgen common stock.